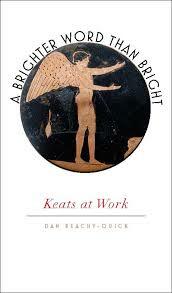 Beachy-Quick’s own leap, as it were, is to forgo comprehensive biography and focus on Keats’s creative evolution, primarily through a chronological reading of his poems and letters from 1816 to 1820. This discussion is interspersed with a series of anecdotal portraits of the poet; in one such portrait, Beachy-Quick writes: “One way to draw an accurate portrait of Keats would be to drop some crumbs on the sill and wait for the sparrows to come.” This experiment may have, on the surface, an element of chance, yet it could also be said, “What will come, if not a bird?” The book takes this flight: observing the poet’s eye and imagination as they wander from urn to myth, from life to death, Psyche to sleep. It’s this last departure that is naturally central to a discussion of Keats. A Brighter Word Than Bright begins with a story of John Keats’s life mask, made in December 1817 by the painter B.R. Haydon. In the aftermath of the casting, the promised replicas are not delivered, the mask disappears, and Keats, through his letters, can be found “[trying] to trace his own untraceable image.” Beachy-Quick describes the anecdote—and Keats’s own discussion of it—as mostly light-hearted, but it carries more symbolic freight in the shadow of Keats’s early death. This is, perhaps, the sense of the poet feeling his “real life having past,” a “posthumous existence” in its stead. The same words spoken by us have been spoken by countless thousands of others through whatever various mutations and permutations time has wrought upon human communication. But there is a sense that because the medium is longer lived than any of us can be, to put the words together in the right way is to channel within those words a voice not wholly your own, but everyone’s. He may not be speaking of the poet directly, but it’s easy to hear an echo of Keats, and an echo of the nightingale too, the “self-same song” through different singers. Bill Carty is Reviews Editor for Poetry Northwest.